Summary: Meet the Bird family. They live in a simple brick house in a picture-perfect Cotswolds village, with rambling, unkempt gardens stretching just beyond. Pragmatic Meg, dreamy Beth, and tow-headed twins Rory and Rhys all attend the village school and eat home-cooked meals together each night. Everybody in town gushes over the two girls, who share their mother’s apple cheeks and wide smiles. Of the boys, lively, adventurous Rory can stir up trouble, moving through life more easily than little Rhys, his slighter, more sensitive counterpart. Their father is a sweet gangly man, but it’s their mother, Lorelei, a beautiful free spirit with long flowing hair and eyes full of wonder, who spins at the center. Then one Easter weekend, tragedy occurs. The event is so devastating that, almost imperceptibly, it begins to tear the family apart. Years pass and the children have become adults, found new relationships, and, in Meg's case, created families of their own. Lorelei has become the county’s worst hoarder. She has alienated her husband, her children, and has been living as a recluse for six years. It seems as though they’d never been The Bird Family at all, as if loyalty were never on the table. But then something happens that calls them home, back to the house they grew up in—and to what really happened that Easter weekend so many years ago. 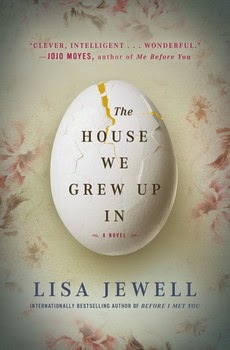 When I was pitched THE HOUSE WE GREW UP IN by Lisa Jewell, I immediately accepted it! I remember reading Ms. Jewell's book years ago and loving them, and I was happy to see that she was still writing. And then I read the review for her latest novel in Entertainment Weekly (one of my go-to sources for book recommendations)... Can I tell you how excited I was for this book? THE HOUSE WE GREW UP IN features a rather dysfunctional family -- and I do love books about messed up families! The Bird family lives in a nice home in the Cotswolds surrounded by lush gardens, and everything appears to be perfect. Lorelei, the mother, is a bit of a free spirit and their father is a nice man. Meg is the eldest and the most pragmatic, while Beth is a bit of a dreamer. The youngest two are Rory and Rhys, twin boys with very different personalities. Lorelei truly treasures her children and all of their artwork... and basically everything else they collect through the years. Her lovely home becomes a bit of a cluttered mess as Lorelei is unable to throw anything away. One Easter weekend, a catastrophe strikes the family that has far-reaching effects. The Bird family is never the same again, as each individual goes their own way and struggles to deal with the aftermath of the tragedy. Meg goes off to start her own family, while Beth seems like a lost soul who is afraid to leave her mother. And then there's Rory who travels to far off destinations and finds himself in loads of trouble. However, it's Lorelei who is perhaps the most affected by the tragedy but shows it the least to her family. She becomes a recluse and a hoarder, afraid to even leave her house overnight. Another tragedy occurs which brings the remaining family members back together to their family home. Secrets are revealed as the Bird family struggles to forgive each other and move on from that terrible Easter weekend so many years ago. I absolutely loved THE HOUSE WE GREW UP IN! Truly, I adored each and every page of the wonderful story about the Bird family. I was totally absorbed in the drama that surrounded their lives, and I couldn't wait to see how the story would end. Naturally, I was hoping for something positive to happen to these folks after having to deal with so much heartache. I especially loved the premise of this novel -- a major tragedy occurs which causes many ripples in this seemingly normal family. It was fascinating to see how each character reacted not only right away, but many years later once they were adults. I especially appreciated that, like some of the characters in the novel, I wasn't really sure what happened that Easter weekend. I knew it was going to be something awful, but I had no idea how horrible it was. Because the family never really discussed what occurred that weekend, they weren't able to deal with it and ultimately move on. It was all so sad! Once the family came back together after the second tragedy, I found their lives even more fascinating. I really think Ms. Jewell did a great job of getting inside their skin and defining their relationships with each other. I really appreciated seeing them come back together and begin their healing process. One very special thing about this novel was how the house itself became a secondary character in the story. I loved the early descriptions and could picture this beautiful house. However, I also could equally picture the disgusting mess it became as Lorelei's hoarding issue took over her life. That the family was able to find some peace and comfort in that very same home was such a great way to come full circle in the novel. THE HOUSE WE GREW UP IN was so smart and insightful and would, of course, make a great book club selection. The story and characters are wonderful, but it also touches upon so many important issues that are relevant to all types of families. There is a reading guide available with seventeen questions. Some of the themes you might want to further explore include mental illness, depression, hoarding, secrets, adultery, escapism, parent/child relationships, family dynamics, addictions, forgiveness, and redemption. I loved THE HOUSE WE GREW UP IN! Highly recommended for fans of family dramas. I love dysfunctional families too and I'm crazy about that cover. Cotswolds! One of my favorite settings ... dysfunctional family? I'm going to look for this. I agree- I loved this one so much despite the often sad subject matter! I found myself thinking about it even when I wasn't reading it! Stories about dysfunctional help me realize my messed up family isn't so abnormal. Another to add to my list!